The day before we were all leaving, we all decided to do a road trip to Mt Baw Baw, via Walhalla to Baw Baw and via Tanjil Bren, home – all places we have been before and so interesting. 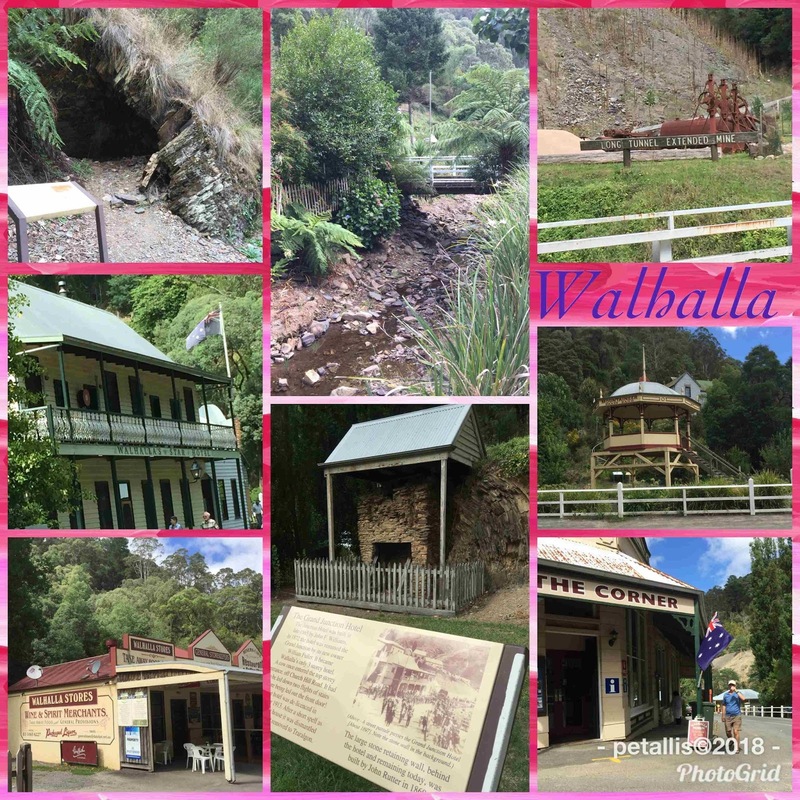 I think Walhalla, along with Gulgong NSW, are two of the most interesting towns. Both were established around gold discovery, and both still look the same as they did 100 years ago. 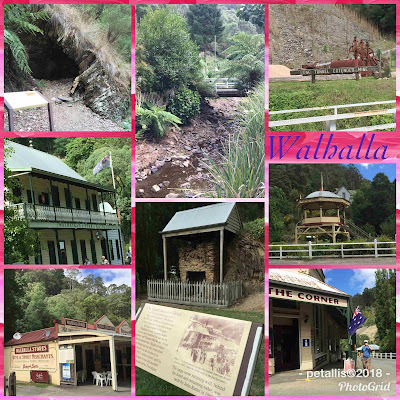 Walhalla is located in the Gippsland Alpine region. 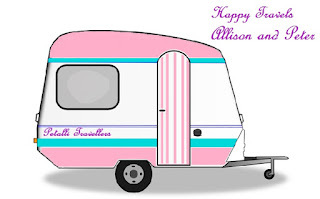 It once had over 4000 gold miners during the 50 odd years of gold mining, but today has only about 20 residents, and many weekender / holiday homes. The main street is full of heritage buildings, and gold is still believed to be in Stringers Creek, now mostly a small creek. Gold was first found in Victoria in 1850, and found in Walhalla in 1862. The town was originally named Stringers and was re- named Walhalla when it was surveyed after the largest gold mine. The mine was named after a German hall of fame from Norse legend. 4 men found gold in the area in December 1862, one a convict named Edward Stringer, also has the creek named after him. He sadly died less than a year later. A few years later a large quartz outcrop was found just above the river, and was named Cohen's Reef after a storekeeper in a close by town. Cohen's Reef became the largest single reef of gold in Victoria. The huge cost of mining gold lead to many individuals or small groups giving up, leaving it to the large companies, like the Long Tunnel Mining Company, which today runs tours of the mine. The mine was worked from 1865 to 1914. In the peak period the town had over a dozen hotels, an carbonated water factory, a Bank of Victoria anda Bank of Australia, as well as many traders, shopkeepers and other support services. A church, police station and court house soon followed. Part of the lock up can still bee seen on the main street. The first road from Moe was completed in 1879, and this saw daily coach services. Today it is mainly a tourist town with a mixture of original and re-created buildings. Many of the original buildings have been destroyed by fire over the years. There is a cafe near the large parking area, and another two near the park parking area (and toilets). The free/donation camping area has been re-located from the old Chinese market gardens area to a much safer and level area, not far away. This was the start of our Victorian Gold Rush part of our trip.Leaving Walhalla we headed along a dirt track to Mt Baw Baw. Mt Baw Baw is the closest downhill snow field to Melbourne – 2.5 hrs - and is 1,567 metres high. 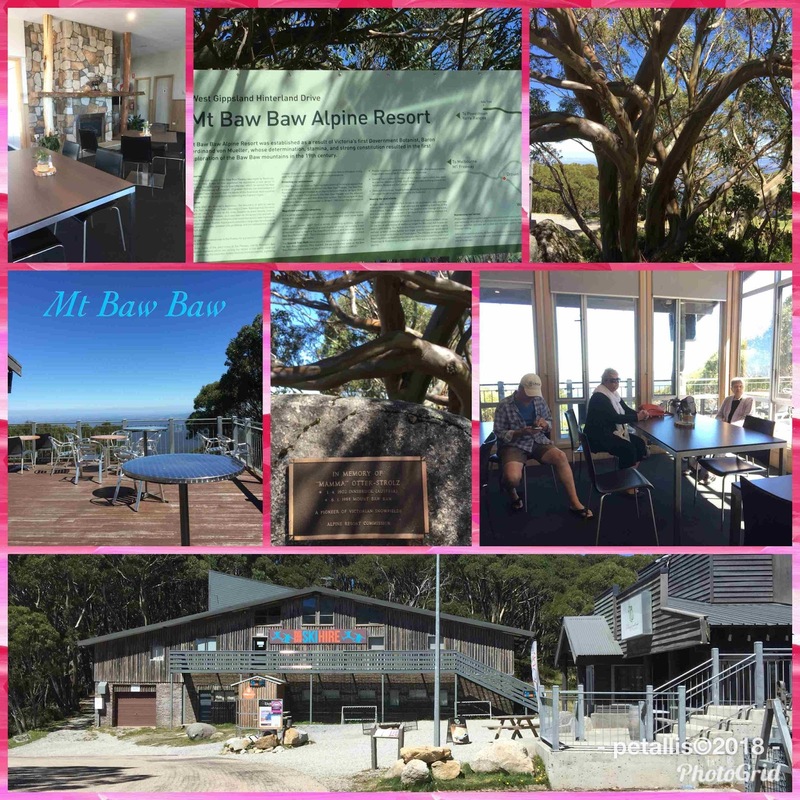 Mt Baw Baw is the home to the worlds tallest flowering plant – Eucalyptus Regnans. The resort offers downhill skiing, cross country ski trails in winter and walking tracks and downhill mountain bike tracks in summer. It is very expensive to park there during the ski season, but in off season it is free. The resort offers a cafe with reasonable prices, and a spectacular view. Well worth a visit. We then drove a short distance along a different road back home, to Tanjil Benji to have lunch. Karen, (SIL) had made a lovely lunch of sandwiches, biscuits, water and soft drinks. 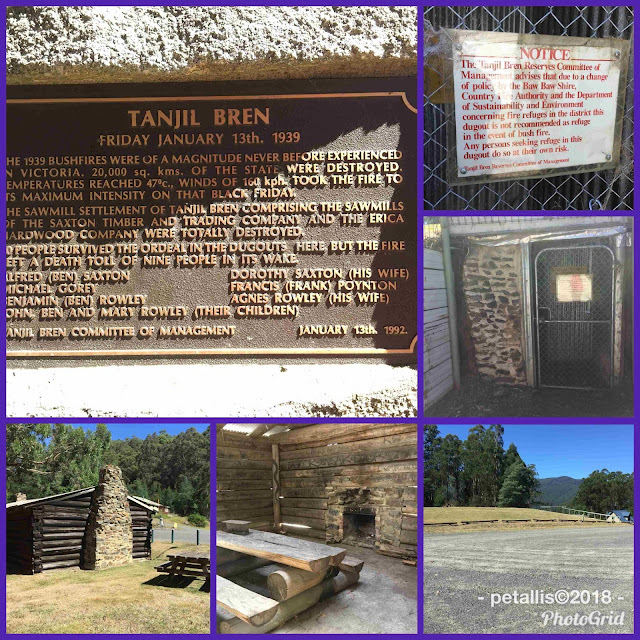 Tanjil Bren is about 10 km from Mt Baw Baw, nestled on the Tanjil River, and is another gold town. Not much remains open in the town, although during skiing season I expect there would be more open, especially accommodation. In the 'gold' times Tanjil Bren had cafes, shops, garage – still there with old petrol pump – a school and a post office. The name comes from the 1844 Tangel pastoral run, and the word Bren, which comes from the saying 'speed of Bren gun' referring to the speed the milling industry operation took over the area. The town was completely destroyed by fires in the Black Friday bush fires of January 1939 and was rebuilt to become a busy saw milling town. 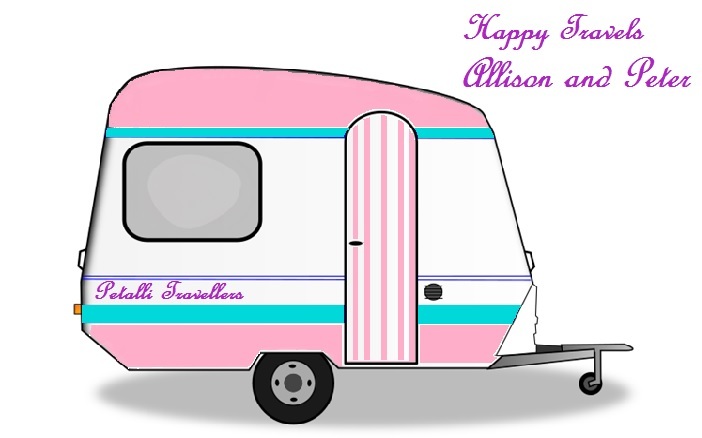 Today it is surrounded by eucalyptus trees. There is a bush fire escape safety mound built in the cleared picnic area. The picnic area has covered tables and seats as well as free bbq's. There is also another stone building with fireplaces each end for the snow season. It is a great place to stop for lunch.